I just finished reading Jonathan Livingston Seagull. Amazing book. Inspirational. One that I think everyone should read. 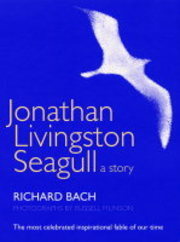 I had received the book, Jonathan Living Seagull by Richard Bach, in gift a year back. Thereafter, I have read it quite some time. It is quite short and simple story. But every time I read it, I found new meaning , better understanding. My family and I got hit with the flu bug about a week and a half ago, and while I’m feeling better now it’s completely thrown off my sleep. 11:30 p.m. – Well, I’ll read a few more chapters of my book. 12:30 a.m. – Alright, I really need to get to sleep now. 1:00 a.m. – My mind is reeling, I feel like it’s an old projector that keeps reeling, and reeling, and reeling, and won’t shut off. 4:30 a.m. – Woken up by my little sister. Ahh, are you kidding me? 5:00 a.m. – Trying to fall back to sleep, because I’ve only been able to sleep for 2 and a half hours, but the projector’s back to reeling, and my mind just won’t stop. 5:30 a.m. – Still awake. 6:00 a.m. – Finally, finally able to sleep a little bit more.